This beautiful photo of Tim. Music and fonts. Pre-made sound effects are used, but i've edited them. Hahaha I loved this concept. It's hard AS ALL BALLS THO!! But I guess it ain't easy bein' Tim... :P I kind of missed an explanation on what stuff causes stress and what reduces it (petting a puppy doesn't reduce stress?!?! whaaaat?) But I figured it out after a while. 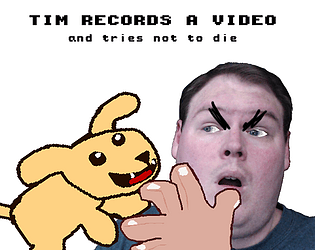 I had great fun ^^ Maybe add some different deaths so there is replay value in seeing how Tim dies this time (that sounds a lot more cruel than it is, trust me :P). 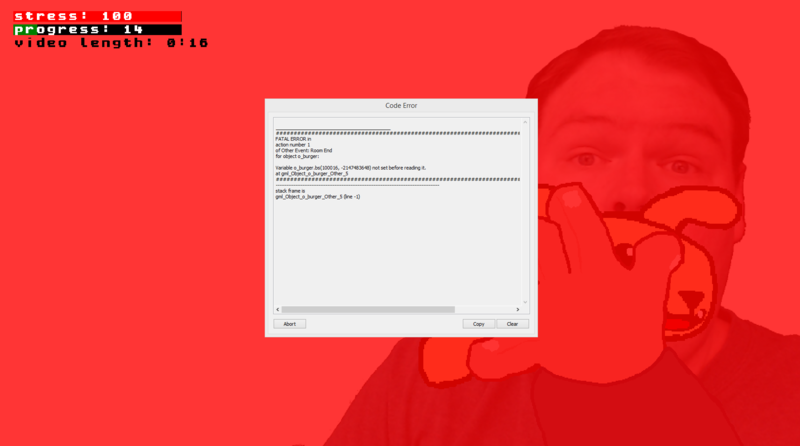 Oh yeah, and the game crashed once: see picture. This was after I died the first round. Didn't show up after that. hi glad you liked it! i actually considered implementing a dog kissing mechanic but decided to scrap it for the sake of avoiding feature creep. i think i've seen that error before. fortunately it's very rare. the multiple deaths sounds pretty cool. little things like that go a long way in making a game more interesting. if there's anything i've learned this gamejam it's that polish and these little things have a HUGE effect on the end-quality of a game. I now know what the WTF rating is for haha. LOL 5/5 on WTF. Hilarious. you got your WTF moment.